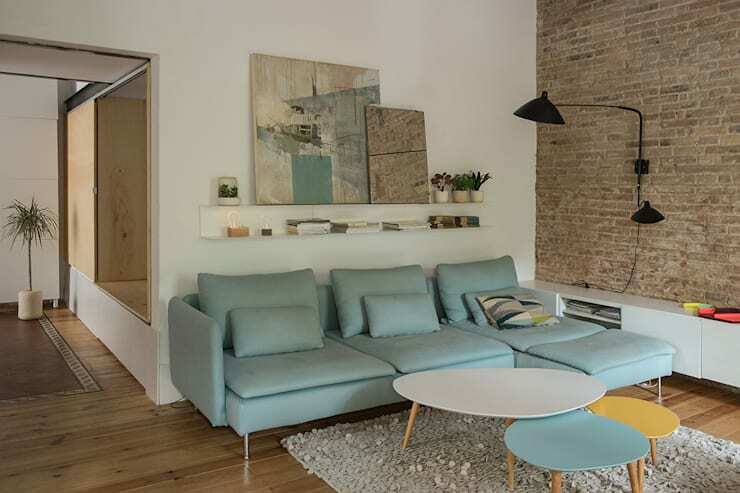 Today, we are going to visit Barcelona, where design professionals Degoma created the most gorgeous, little multi-functional home that we could all learn a thing or two from today. This homify article is a wonderful example of how space can be utilized as well as how trend and style has a place in just about any home. In fact, today you may realize just how true the saying dynamite comes in small packages is! The interior design of the home is very light, warm and appealing thanks to the neutral tones and earthy materials employed throughout. 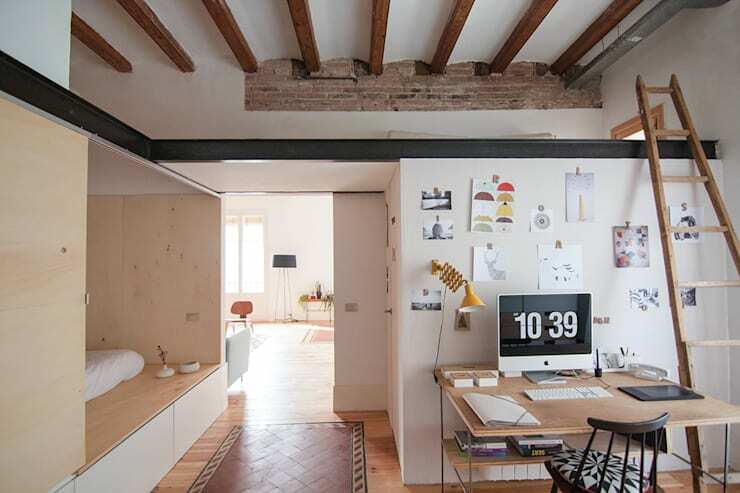 The light wooden floors complement the white walls, while the exposed brick and wooden ceiling beams bring an industrial chic look and feel to the space. We can also see that the designers have gone for an open-plan design, with sliding doors that subtly separate areas if need be. 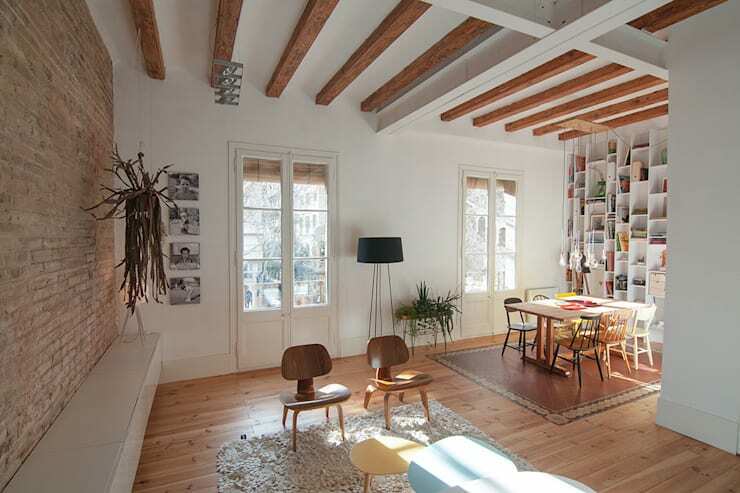 This creates a home that feels very spacious. It also creates a wonderful flow between areas of the house. Already we can see just how multi-functional this home is with a savvy study area on the right and a trendy ladder, which is functional and stylish. In a small home, you really have to utilize every little nook and cranny. 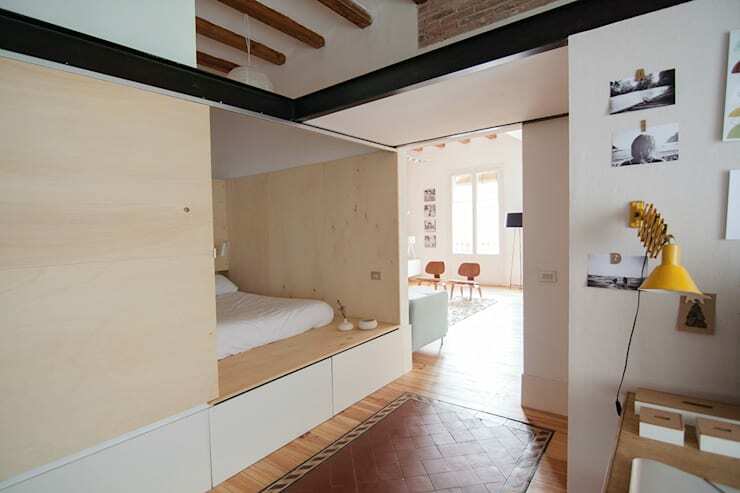 This is exactly what the designers have done in this area of the home, where a bedroom fits snugly into a large niche. They have also ensured that there is plenty of storage space, with large drawers that roll out underneath the niche. Here clothes and other personal items can be stored neatly away – a huge advantage to any small home. It ensures that only the most functional and necessary items are on display. 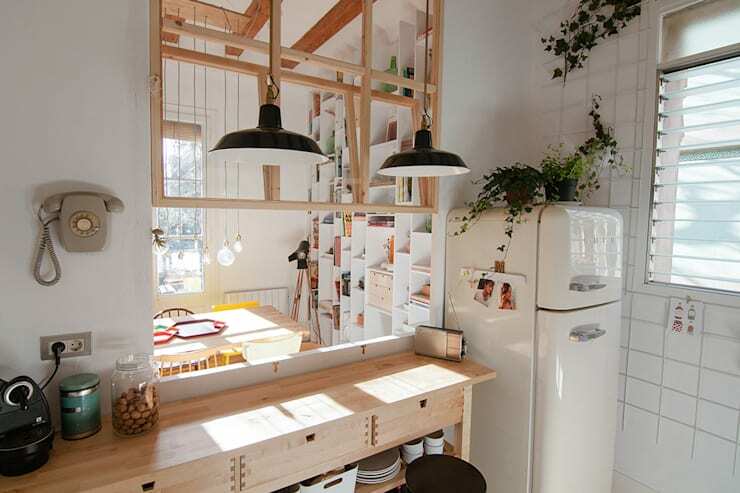 Have a look at these really clever storage solutions for small homes for inspiration. The bedroom is sweet and minimalist, with only the most necessary of items and objects in the small space. A double-bed mattress with simple, white linen takes up most of the space while a patterned cushion brings a subtle touch of personality and charm to the area. The designers have installed two bedside lamps in the wall above each side of the bed, allowing for functional reading light. These lights also create ambiance and romance if need be. Tip: Neutral tones in a bedroom create a very calm and serene space. The living room of this home is slightly more detailed than the bedroom. Soft blue and grey tones have been introduced, giving the area a bit of colour and personality. The designers have used a long, narrow shelf along the wall to put beautiful pieces of artwork and some small pot plants on display as well as a few books and magazines. These have all been carefully selected, ensuring that they enhance the room. Functionality and style collide in the form of the plush grey rug and the sleek, black lamp. Couldn't you imagine relaxing in this gorgeous room with a good book? The living room spills into a charming dining area, with plenty of natural light flowing through the large glass windows and doors. In a small home, natural light can play a huge role. It not only creates a warm environment, but it makes the interiors look much lighter and brighter as well as more spacious and expansive. In the evening, the designers have ensured the living area still receives plenty of light without overwhelming the space in the form of lamps – a great tip! Have a look at these other dazzling lighting ideas for modern houses. Tip: Add a pot plant or a fresh vase of flowers to a home for a subtle yet effective form of decor. In the dining room, we truly get a sense of how functionality and style work in harmony. 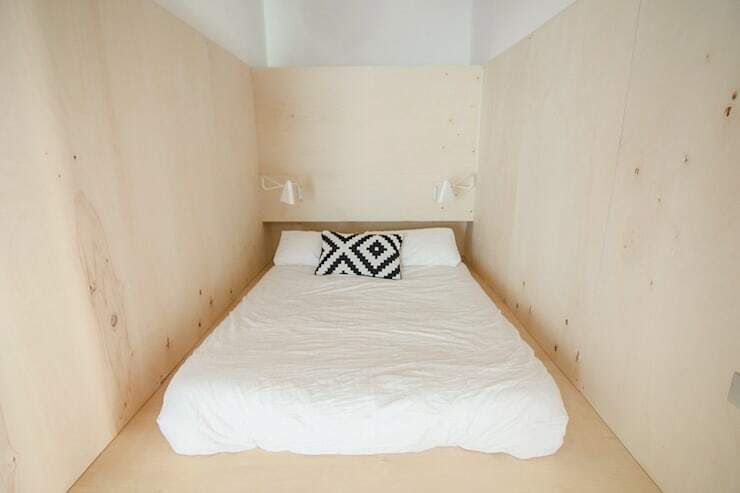 The designers have used an entire wall to install different shaped shelves and drawers. 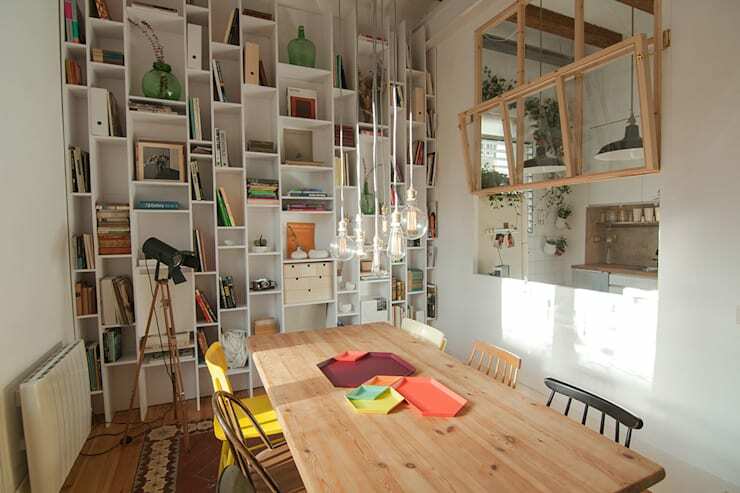 These maximize vertical space, while allowing all sorts of objects, books and picture frames to be on display. This really creates character and charm! The lighting in this area of the home is also very stylish and trendy. Don't you love the industrial chic lamps that drop down over the dining room table? Tip: Pair a simple wooden dining room table with different types of chairs for a very retro look and feel. The kitchen is tucked in the corner of the house, subtly separated by an open wall. This allows it to remain integrated with the dining room, while keeping the noises and smells from cooking slightly separate. The designers have used the features in the kitchen – such as the refrigerator and the telephone – to bring a retro touch to the space, without overwhelming it. This is another area where storage is also vital. Every piece of cutlery and crockery has a home, where it is stored neatly away while still accessible. 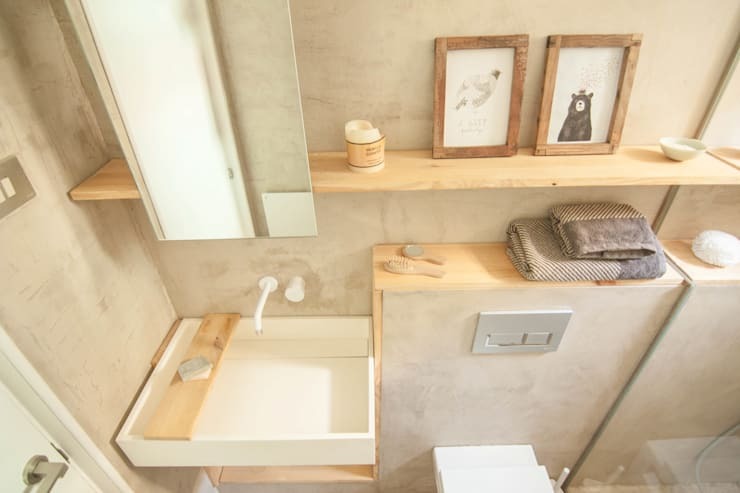 We end off our tour in the bathroom, which is warm, serene and cozy thanks to its raw cement walls and light wooden features. Remember that your bathroom is a space where you are meant to feel at peace, which is exactly what the designers have achieved here. Earthy tones and warm, neutral colours and materials are very appealing. This is truly an area where you could get ready for the day with a clear head! Again they've played with vertical space, creating little nooks and crannies to put items on display and keep them stored neatly away. Have a look at these tips to take your bathroom to a whole new level with 6 storage ideas. Would you want to live in this small home?